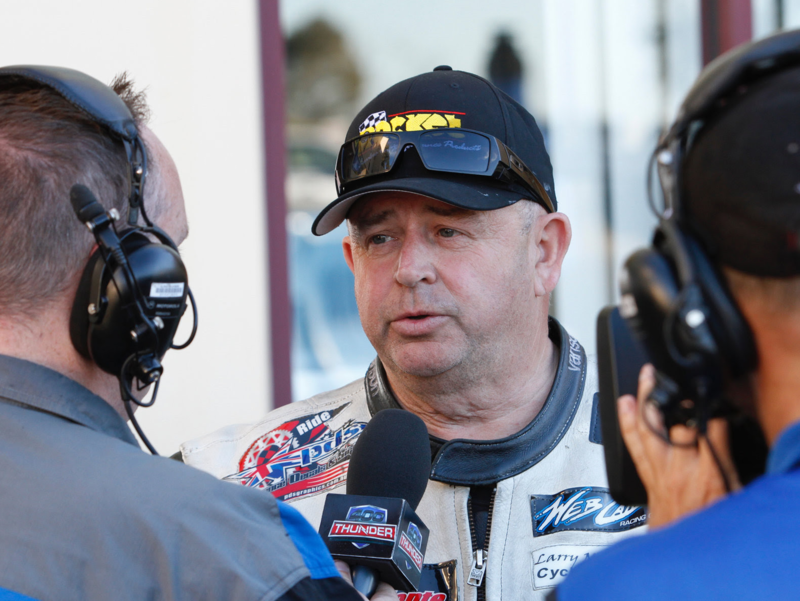 After taking out the much-coveted MacTrack Westernationals event earlier this month at Perth Motorplex in Western Australia, No.1 plate holder Chris Matheson is not letting up on his focus on continuing his lead in the Australian Top Fuel Motorcycle 400 Thunder Championship. Following his return home to Queensland after five days on the road in his team’s transporter, Matheson had plenty of time to think and rehash his runs in Perth. “It was an event that didn’t quite go to plan; however, that is the nature of the beast when you burn nitro and push out over 1500 horsepower,” said Matheson. But the one goal that has always remained on top of the list is – “Go Quicker”. 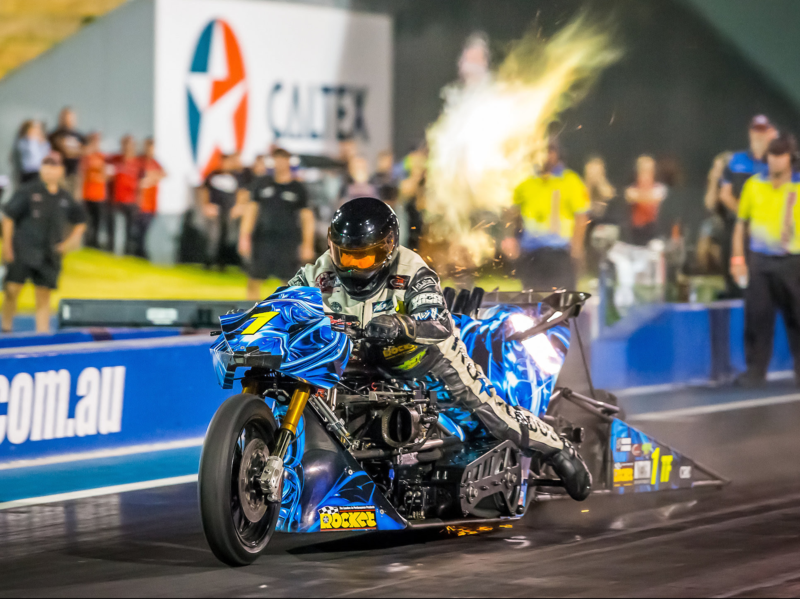 Round 5 of the 400 Thunder Top Fuel Motorcycle Championship is the Santos Super Thunder meet held on Easter Friday at Matheson’s home track Willowbank Raceway. “We have run really quick here with our best ever numbers and I am hoping to continue that in a few weeks time. Right now I have a reasonable points lead in the championship so have the opportunity to try a different combination and continue the development of the motorcycle,” said Matheson. “The next three rounds are where the championship will be won, lost and records reset. The tracks will be good, and with the hot summer now over, the weather will be optimum for quick times. “We just have to maximize our opportunities as best as we can. The Easter round is a one-day meeting with four passes. So we need to pick our set-ups and make informed tuning calls if we are to see improvements. “Unfortunately we broke a gearbox at Perth on the first pass. We fixed it but missed the call for our second run. However, after that, the “Nitro Voodoo” bike started to show its potential and went on to win with some good numbers. “The engine is now fresh and we just need to get out there and do our thing,” grinned Matheson. “As we move into the pointy end of the 2017-18 400 Thunder Championship calendar, it’s great to get a meeting every month. It keeps the team in sync and keeps me in the mind zone with riding the bike. “The Santo Super Thunder is one of my favourite events on the calendar and I’m looking forward to running some fast numbers in front of my home track fans and supporters. This event reminds me of a rock concert with lots of coloured lights, noise and an enthusiastic crowd. That always pushes me on to give them a spectacle and performance they won’t forget, and I know the team are pumped to get it on. Chris Matheson Racing is proudly supported by the following sponsors – Kitten Ultra, Rocket Industries, CRC, Web Cam Racing Cams, Larry McBride, World Wide Bearing Company, Boninfante Friction Inc, Performance Decals & Signage, Bill Furr Orangeburg Cycle Racing, Hi-Side Leather Repair, Performance Wholesale, GT Radiators & Machining, GT Radiators, Boninfante, Great Southern Diesel Services, Aeroflow Performance and Ballistic Performance Parts. Hector Arana Jr. Runs First Official 200 MPH Pro Stock Motorycle Pass!